Travelling Gothic Witch: Cupcake anyone? i have been in a spot of baking mania so i thought i would share with you a creation i did a few years back that is sure to make even the blackest of hearts go aww and want to gobble them all up. 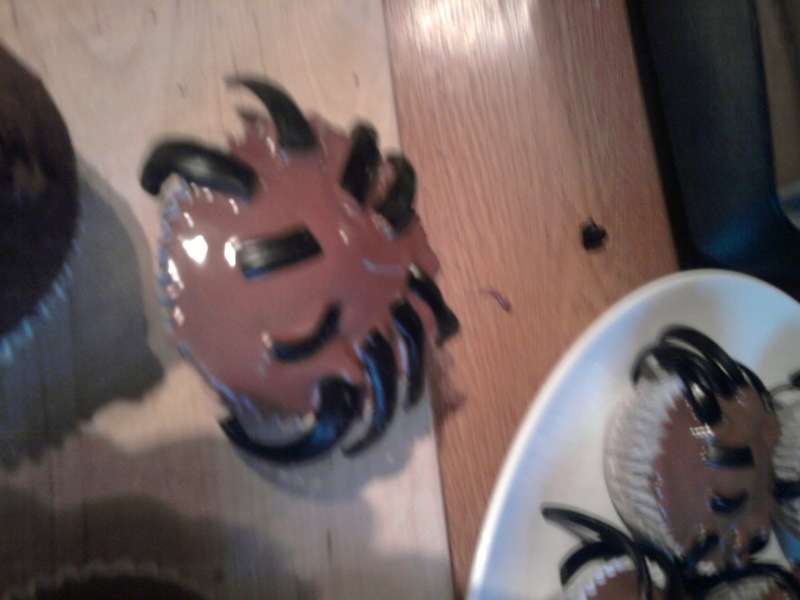 i present to you spider cupcakes. adorable yes? well they are incredibaly easy to make. simply mix up a batch of your favourite cupcakes i would suggest chocolate or red velvet but you could use anything really and then decorate using melted chocolate or chocolate icing (up to you) and get the licquorice pinwheels unwind cut into little strips and place on top for eyes and legs so extremely simple and probably not the best thing for this time of year but what the hell i think they are good any time of the year so get baking enjoy and have a good week people. i may not be posting for a little bit due to coursework but i will try my best to at every opetunity.